Hunting is the practice of pursuing animals to capture or kill them for food, recreation, or trade of their products. In modern use, the term refers to regulated and legal hunting, as distinguished from poaching, which is the killing, trapping or capture of animals contrary to law. Hunted animals are referred to as game animals, and are usually large mammals or migratory birds. By definition, hunting strictly speaking excludes the killing - though the same techniques may be used - of individual animals that have become dangerous to humans and the killing of non-game animals, domestic animals, or vermin (or "varmints") as a means of pest control. Hunting may be a component of modern wildlife management, sometimes used to help maintain a population of healthy animals within an environment's ecological carrying capacity. Wildlife managers are frequently part of hunting regulatory and licensing bodies, where they help to set rules on the number, manner and conditions in which game may be hunted or "harvested." Read "What to Say to a Person Who Has Never Hunted"
The pursuit, capture and release, or capture to eat of fish is called fishing, which is not commonly categorized as a kind of hunting, although many hunters may also fish. Trapping is also usually considered a separate activity. Neither is it considered hunting to pursue animals without intent to possibly kill, as in wildlife photography or bird watching, or to "hunt" for plants or mushrooms. Before the widespread domestication of animals, hunting was a crucial component of hunter-gatherer societies, and is a theme of many stories and myths, as well as many proverbs, aphorisms, adages and metaphors even today. Persistence hunting may well have been the first form of hunting practiced by paleolithic humans. It is likely that this method of hunting evolved before humans invented missile weapons, such as the spear thrower or the bow-and-arrow. Since they could not kill their prey from a distance and were not fast enough to catch the animal, the only reliable way to kill it would have been to run it down over a long distance. During the persistence hunt an antelope, such as a kudu, is not shot or speared from a distance, but simply run down in the midday heat. Depending on the specific conditions, hunters of the central Kalahari will chase a kudu for about two to five hours over 25 to 35 km (15 to 22 miles) in temperatures of about 40 to 42 °C (104 to 108 °F). The hunter chases the kudu, which then runs away out of sight. By tracking it down at a fast running pace the hunter catches up with it before it has had enough time to rest in the shade. The animal is repeatedly chased and tracked down until it is too exhausted to continue running. The hunter then kills it at close range with a spear. 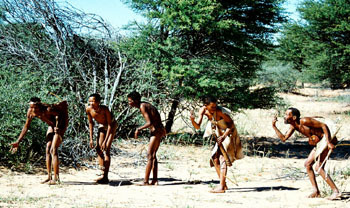 The persistence hunt is still practised by hunter-gatherers (Bushmen) in the central Kalahari Desert in Southern Africa. Even as animal domestication became relatively widespread, hunting was usually a significant contributor to the human food supply, even after the development of agriculture. The supplementary meat and materials from hunting included protein (literally "the most important") food, bone for implements, sinew for cordage, fur and feathers for ornament, with rawhide and leather also used in clothing and shelter. The earliest hunting weapons would have included rocks, spears, bow and arrows. On Ancient reliefs, especially from Mesopotamia, kings are often depicted as hunters on big game such as lions, specially from a war chariot, another virile status symbol; perhaps the archetype is the legendary biblical Nimrod (king). The cultural and psychological importance of hunting in ancient societies is represented by deities such as the horned god Cernunnos, or lunar goddesses of classical antiquity, Greek Artemis or Roman Diana. Taboos are often related to hunting, and mythological association of prey species with a divinity could be reflected in hunting restrictions such as a 'reserve' surrounding a temple. Euripides' tale of Artemis and Actaeon, for example, may be seen as a caution against disrespect of prey or impudent boasting. Hunting is still vital in marginal climates, especially those unsuited for pastoral uses or agriculture. Inuit peoples in the Arctic trap and hunt animals for clothing, and produce complicated parkas consisting of up to 60 stitched pieces capable of with-standing sub-zero temperatures. From the skins of sea mammals they may make water-proof kayaks, clothing, gloves and footwear. With domestication of the dog, birds of prey and the ferret, various forms of animal-aided hunting developed including venery (scent hound hunting, such as fox hunting), coursing (sight hound hunting), falconry and ferreting. These are all associated with medieval hunting; in time various dog breeds were selected for very precise tasks during the hunt, reflected in such names as pointer and setter. Planning a First Hunting trip to Africa?